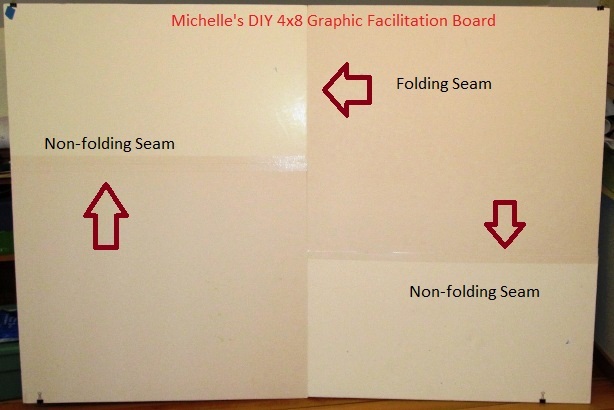 Has anyone made a portable ‘wall’ (that fits into a car) to bring to meetings that don’t have great walls and if so, do you have tips or a guide to share? People shared loads of ideas including buying walls from Neuland or Athenaeum as well as home made ideas such as using foam core, gatorboard, and rigid insulation to name a few. I spent time visiting the local hardware stores, sign making shop and office supply store trying to find my material of choice. I knew it was experimental so didn’t want to spend too much money. In the end, I came across some 1/4 inch foam core that had been printed on one side for a project but had errors so was destined for the landfill. The backside was plain white. Aha – my chance!! Due to odd sizes of the 4 foam core boards, I cut them to fit a 4×8 piece of paper and taped it together with white duct tape. The widthwise seams are solid and don’t fold as one is on the top section and the other is on the bottom section. The center seam is taped on the back and foldable so it fits in the back of my car. The best place I found is in the backseat, straight up and down, leaning against the seat. It also fits in the hatch back on an angle. I clip paper to the edges of the board rather than using tape which is great and keeps the paper looking nice. To date, I have leaned the board against the wall on top of a table and stretched across to write or use it simply to tell a story via a pre-drawn mind map or something. It’s a little flimsy for a tripod which may be due to the less-than-thick nature of the board. I am somewhat satisfied with the output as for a practically free experiment, its useful for holding visuals where the walls aren’t great and a good back-up to bring along when you aren’t sure of the room you are going to work in. I am pleased to say I used it last week when I encountered mediocre walls in a condo meeting room setting. I leaned the board (holding a large mind-map ‘visual summary’) across a mantle over a fireplace and people could view it and discuss it from different parts of the room. It seemed to work well! On the flip side, I don’t find it rigid enough to really write on with haste. 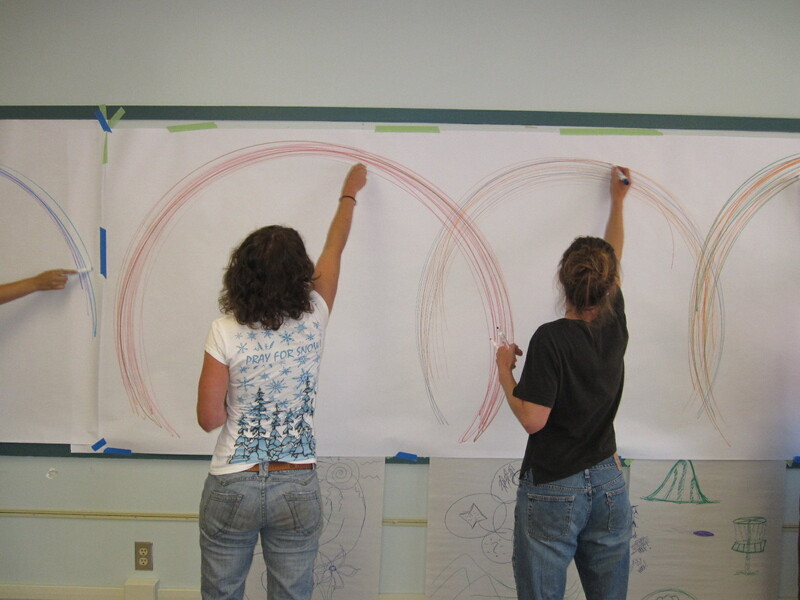 Drawing on Walls at the 2011 Graphic Facilitation Workshop in Rossland, B.C. The workshop was a full 2.5 days of learning, practice and sharing ideas with a diverse range of fantastic people. While the workshop may have ended, the community is strong with active postings and sharing on our community Facebook Page (Rosviz10), Flickr (search rosviz) and Twitter (#rosviz). It’s amazing to see the back and forth and ongoing support of each others’ work. Small things make a big difference when communicating with visuals. For example a little shading, a few shapes, and choosing a great colour palette make the visual pop and grab peoples’ attention. 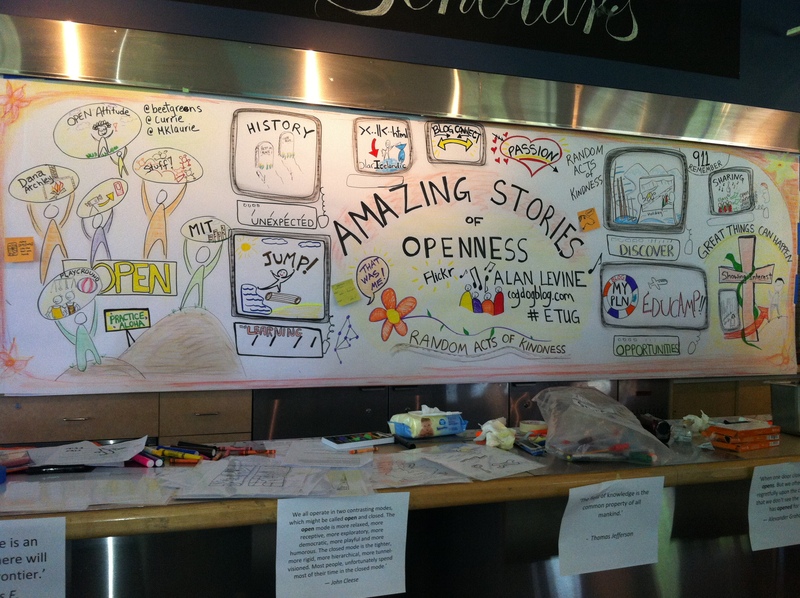 Technology could help strengthen the future of graphic recording. As more and more people use iPad’s and other devices with drawing technology, I believe we will see more use of visuals in mainstream work. Our workshop created an incubator for risk taking. Each person took risks in their own way. For some it was the art, for others it was telling a story and for others it may have been sharing their feedback. The workshop setting and group vibe created a safe place for people to step out of their comfort zone and try new things. During the workshop, 2010 workshop participant Sylvia Currie, took on the role of ‘social reporter’. This video captures the essence of the workshop really well! She captured interviews with participants on their experience posted here, she blogged about the workshop here (fantastic post by the way!) and she posted photos here. 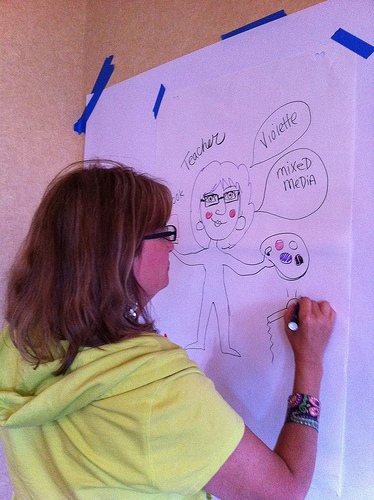 She also recorded the Elluminate session with alumnus Susan Stewart on iPad graphic recording. 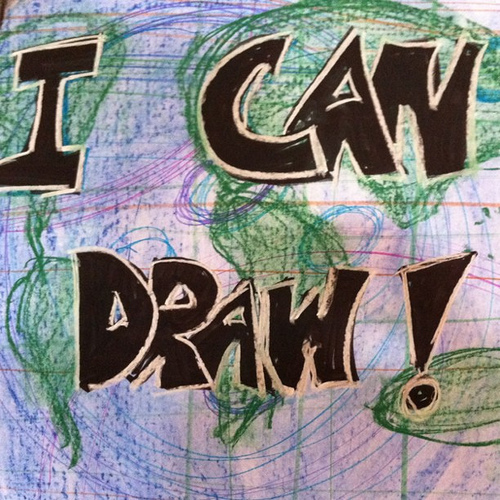 Nancy White, my co-conspirator, posted her photos here, the icon drawing jam here and . Violette Clark (workshop participant) also created a blog post and likely there are more. This is a call to all workshop participant’s to share your blogs if you posted something (use the comments feature, thanks!). If you are on Flickr, Twitter, Facebook or other sites and looking to find posts – use rosviz as your search term. 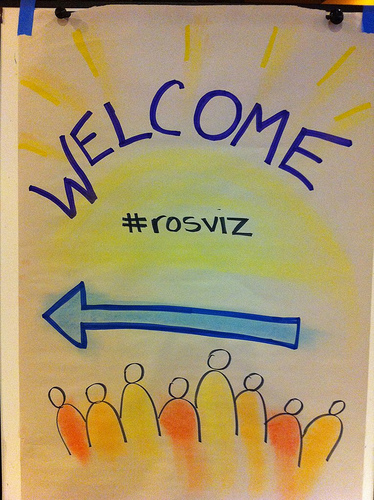 As twitter posts change so quickly, our #rosviz tweets are archived here. 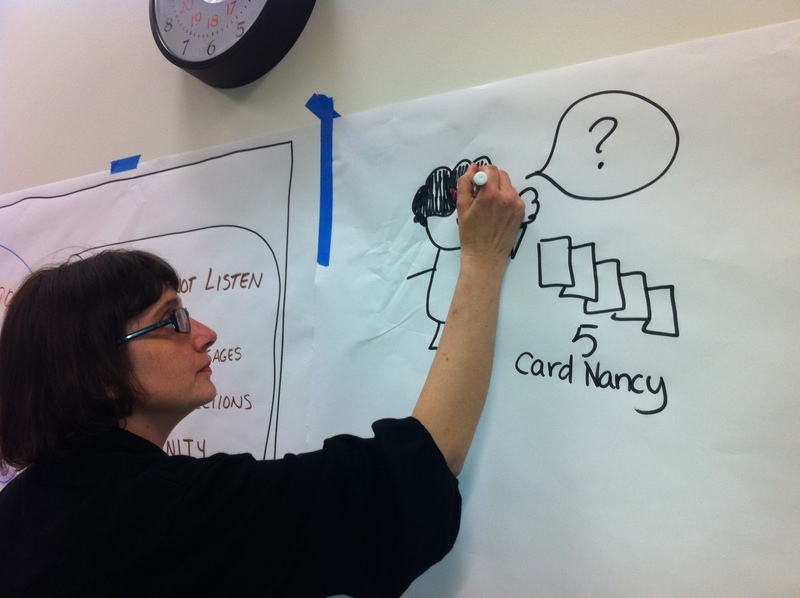 If you know others who want to learn about graphic facilitation and graphic recording, please stay in touch and let us know. If we can gather a critical mass, we may be able to do this next year….it really is so much fun! 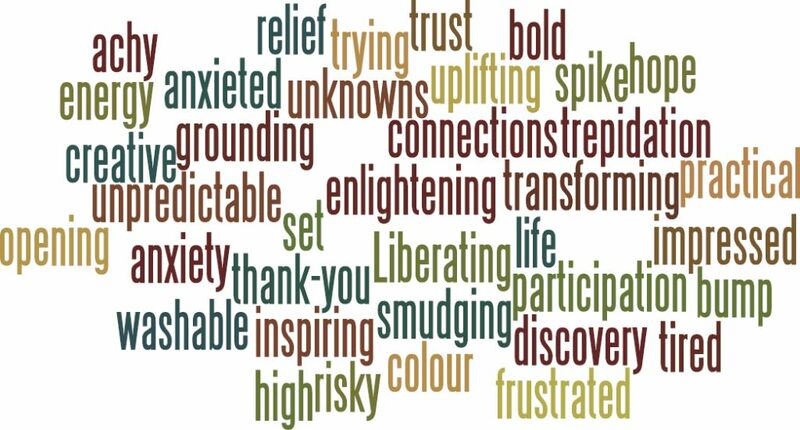 Before signing off, parting words to those who participated…..practice when you can, continue learning and use the community for support and inspiration! Thank you again to all the workshop participants in 2010 and 2011, co-organizers/ supporters and to those who followed along via social media. This is a re-post from Social Reporter Sylvia Currie and her blog “Webbed Feet“. Thanks to Sylvia, I will be posting several links in the coming days to workshop interviews, videos, photos and blog posts! Yesterday we arrived in Rossland, British Columbia from a variety of locations for the 2nd annual Graphic Facilitation workshop. A few of us did some prep work to get ready for the kick of graphic jam — hanging paper, prepping the floor space with plastic to catch chalk dust, and throwing open the curtains to let the natural light in. It was exciting to put names to faces and learn about the various backgrounds and reasons for coming to the 3-day workshop. 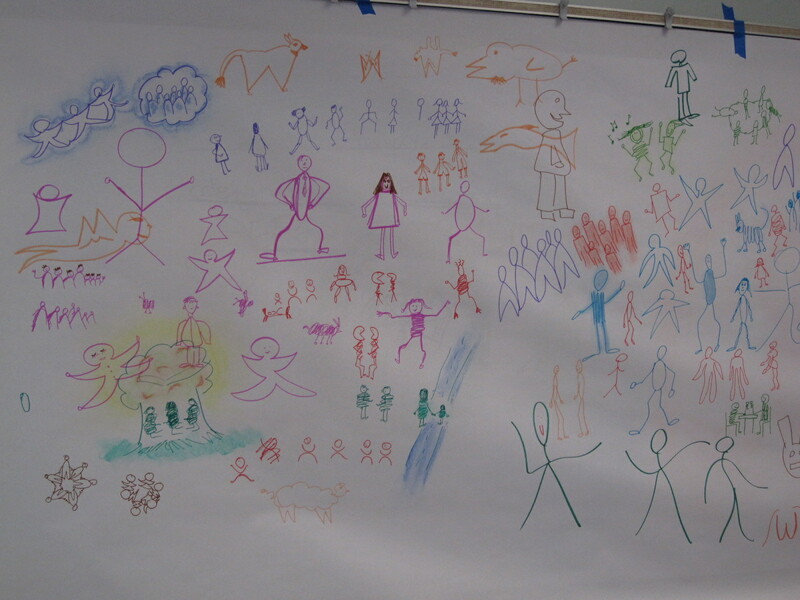 The first activity was a visual introduction. 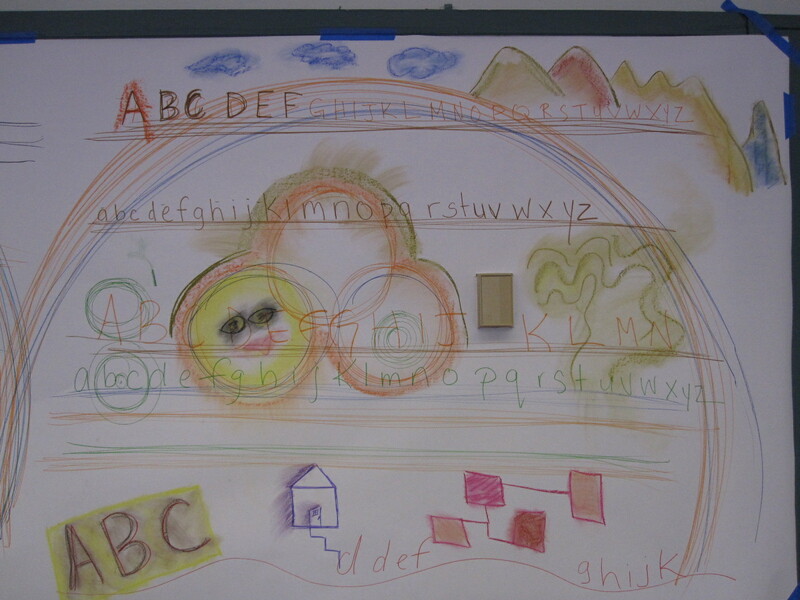 In 5 minutes the 20 participants came up with drawings that gave us a lot to talk about! We toured the room and participants described what they saw. Not your traditional round robin intros! Next Nancy made sure we warmed up properly and became aware of space around us by using our whole bodies. BIG circles! Rockin’ straight lines! From there Nancy introduced participants to basic concepts around lettering, spacing, colour, and everything else that emerged from the group. One thing I really appreciate about Nancy White’s teaching style is that she uses the work of participants to point out different styles, design principles, impact of colour, use of space, and so on. We don’t always work through all skills and concepts systematically. By the end of the evening graphic jam we were talking about what works, what frustrates us, what we’re curious about… because we had plenty of time to experiment. We’re capturing bits and pieces that will give you a glimpse of what happens in the #rosviz graphic facilitation workshop. On to day 2! It’s been an exciting month for me as a novice visual practitioner. I owe a lot of this to taking the advice of Nancy White who told the students of our graphic facilitation workshop last year to simply ‘step forward’ and start drawing when opportunities arise. It’s a bit scary however after the first line is drawn on the paper it seems to come together. As lead up to this fun event, Sylvia Currie and I gave a talk at Northern Voice in Vancouver on the topic of Visual Thinking. Approximately 60 people put their pens to paper to illustrate themselves in visuals with minimal text. The room was buzzing and energy levels were high. The best part was having people practice in Moose Camp (open space) and seeing them get out of their seats to co-draw in the room. Thanks to everyone who partook – it was a lot of fun and very inspiring. Below are a few pics from the experience. I continue to be inspired by the power of visuals to make more meaning from the work we do and the world we live in. Furthermore, it helps for retaining information, creating shared understandings and having fun! 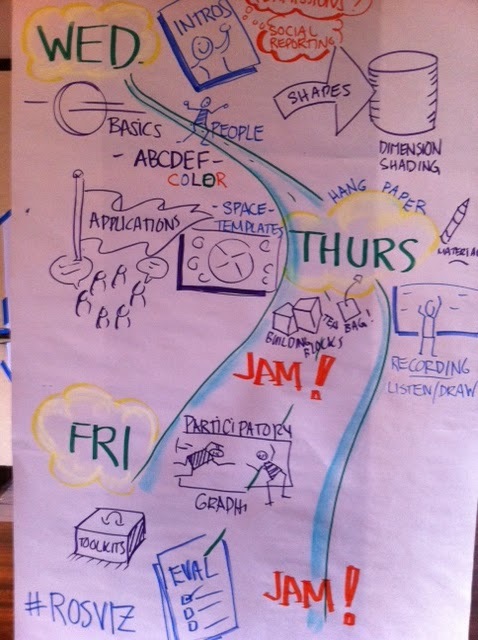 Today was Day 1 of the Graphic Facilitation Workshop I have been organizing with Nancy White. I organized the workshop with the ulterior motive of wanting to take the workshop and learn more about visual practice. It was a great day! 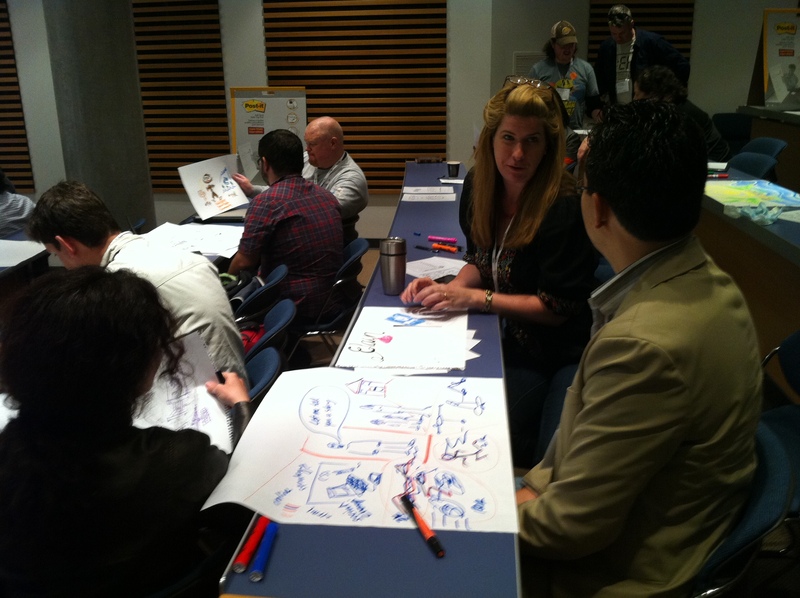 Everyone learned a lot in a few short hours…and people found this evolution very empowering. 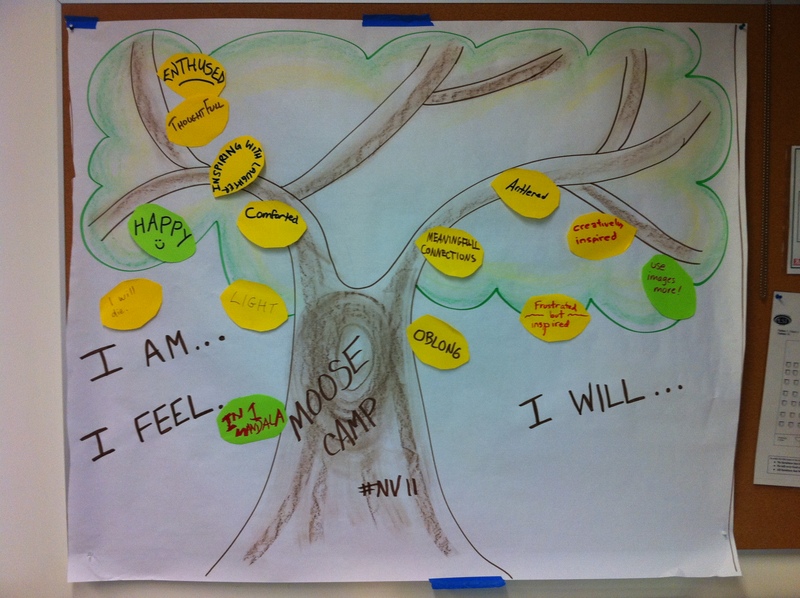 Creativity was flowing and now everyone wonders…when and where can we use this in practice? Are there safe spaces? Will people be willing to play along? Some advice we were given: Be Obvious, Accept Offers, Fail Cheerfully. Looking forward to Day 2 tomorrow!